Forget about all the hype surrounding iBooks and iPads, and let's just enjoy, until we can, the resurgence of traditional, pulpable fiction thanks to angels, demons and vampires. Since Alma is Spanish for "Soul", no one can accuse us of cinically jumping on the first available bandwagon: we simply want to be truer to our name. And if I have asked my authors to revise their books between the publication in hardback and the mass-market edition to include as many supernatural elements as possible, it's only in order to encourage reading among the younger generations. I have commissioned Simon May with a new collection of aphorisms, Thinking for Zombies, while Anthony McCarten's 2006 novel Death of a Superhero has been reissued with a new cover and under a new title: The Werewolf's Demise. I have also recast my own novel, Bestseller, no longer having the UK publishing industry as its background, but now set among the living dead. I often wonder if we owe this new interest in ghouls and monsters to JK Rowling and her Harry Potter series, or if it's because many of the young readers who consume these books see them as an extension of their Playstations. It's probably a bit of both. I read the Wall Street Journal article on 'The Death of the Slush Pile' with interest – a great piece with great stories in it. Read it and don't despair, aspiring authors! We are one of the few literary publishers in UK who still accept unsolicited manuscript. Even Faber and Faber gave up a couple of years ago. If I remember correctly, they said only one in 6,000 submissions made it into their list, so it wasn't really worth it. Statistically speaking, it's not much better for us, but we still believe in the "democratic ideal" of the slush pile, and we also think it's a good to keep your ear on the ground and have a direct link with writers. Most submissions are dire, it's true – but aren't most agents' submissions bad anyway? We receive around 100 submissions a week – I'd say half by post and half electronically (many people call or follow up by phone, which is a bit annoying). I think we receive so many because we are near the top of publishing lists – that's a trouble when your name starts with A.
Email submissions are usually deleted, but we do have a look at all mail proposals, and try to reply within two to six weeks. Sometimes we reply within a week. Last time we publish a book from the slush pile was in 2007, and it wasn't a commercial success, but we've become great friends with the author, who is very talented and may soon write a bestseller for us. So I think that, even if time-consuming, going through the slush pile is a laudable and potentially rewarding effort. And, by the way, we are changing our name from Alma Books to Zzzzz Press. I mentioned a hilarious bit from the Bookseller in yesterday's post. But for the rest, reading the Bookseller was more depressing than reading a war bulletin or Thomas Hardy's Jude the Obscure. Literary agencies are losing money – United Agents £2M, PFD close to £1M, Aitken Alexander £850K, Sheil Land £75K, Curtis Brown £14K – bookshops are going bust (Borders, Wesley Owen, not to mention dozens of small independents) or making major losses, authors' advances are being eroded, major ebooks wars are being waged, the cost of paper is going up 30%, Gordon Brown . . .
Who is making money in this industry? No one, apparently. Or rather, evidently. Does the publishing industry – or at least the publishing industry as we know it – have a future? I am becoming more and more pessimistic by the day. Maybe I am just getting old. Bookseller, please give us some good, life-enhancing news! 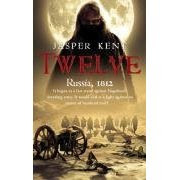 This tale of vampiric intervention in Napoleon's invasion of Russia in 1812 seems a more likely commercial prospect than Robert Masello's Blood and Ice, which features Crimean vampires in Antarctica, due from Vintage in June."